Back in high school, my classmates and I started our own eco club and recycling program. Along with that, we would go to Venice beach and do beach clean up in the enclosed area where the Least Terns would stay. Being involved in these kinds of activities changed the way I saw trash and I started to recycle and re-use as much as I could and I still do. Being from Los Angeles, I visit the beach quiet often. I always see trash on the sand and the occasional cup in the water and it was easy to just clean up and I wouldn’t mind going into the ocean. The area in Ballona Creek where Carlos and I survey is a whole other story. 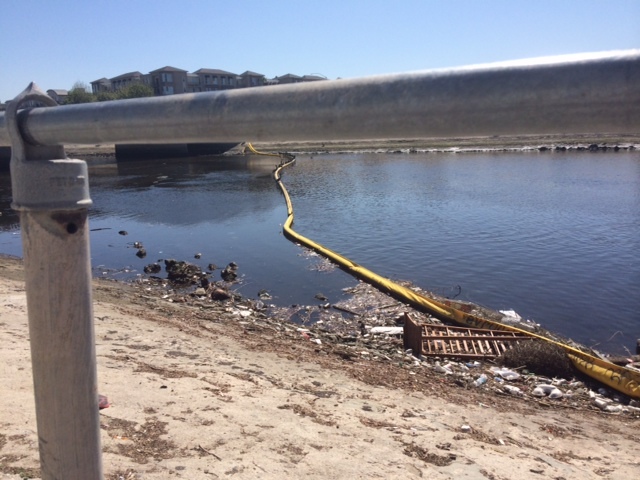 There is trash all along the creek, and the net that is supposed to catch the trash before it hits the beach isn’t enough. Every time we survey we see a shorebird walking along the trash trying to find something to eat. It’s sad to see these creatures have to suffer because of what some people do. 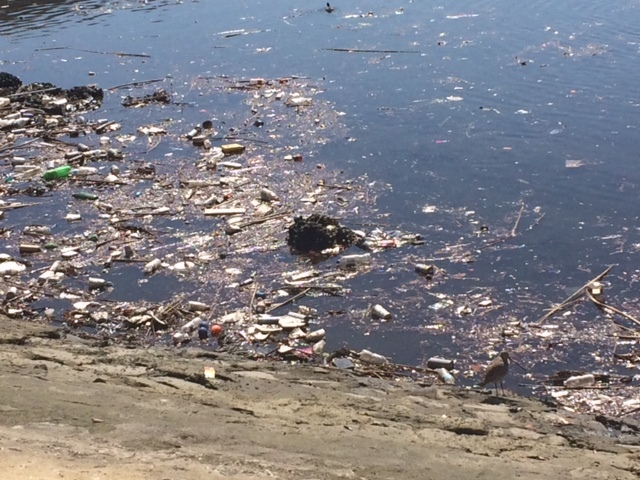 I would love to organize a Ballona Creek clean up but it seems to might be harder that it looks. I hope that one day everyone becomes more aware that trash does end up in the ocean and not only is it bad for the environment and us but it is also bad for the animals and birds. 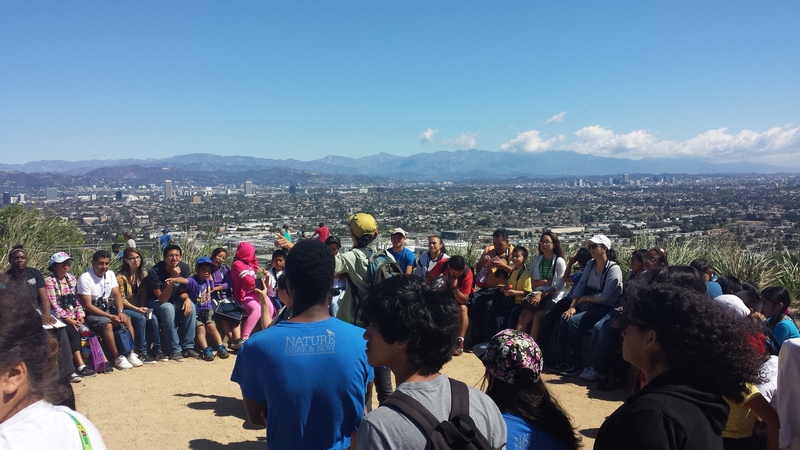 This week I had the opportunity to join Dorsey High and Leo Politi Elementary students in a bird walk at Baldwin Hills Scenic Overlook. The park is very nice and well maintained. The view at the top is amazing. 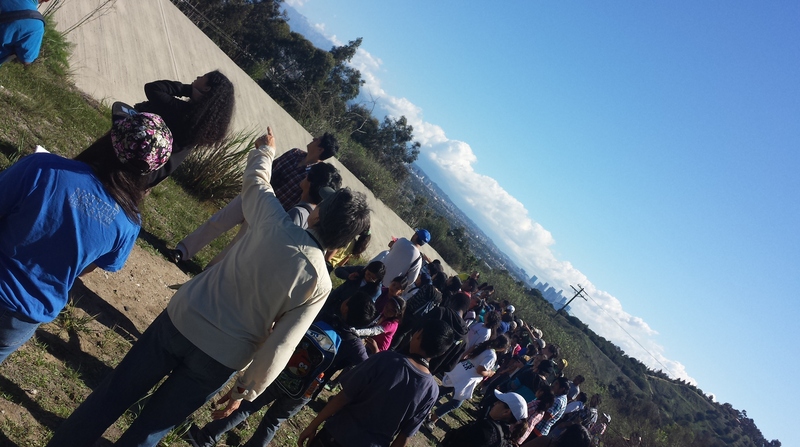 You are able to see the whole city surrounding the park and the ocean at the distance. It was great to see all the students very excited to walk around with binoculars and try to identify birds we encountered. They were given tasks throughout the day, like a scavenger hunt and writing a poem about what they felt and saw being outdoors. It was a very fun experience and I am looking forward to participating in more events with all the students. On one of my surveys this past week I had assistance from an experienced shorebird surveyor, Dan Cooper. I was able to ask him questions I’ve been wondering regarding species that I wasn’t seeing and about my surveying technique. I was reassured about the birds I was identifying and my technique and now I am more confident during my surveys. He also informed me about possible careers and conferences that I am interested in hearing more about. I learned a lot from him and I hope to work more with him in the future. It’s been three weeks since we started surveying, and although I’m familiarizing myself with my location, I realized I don’t know much of the history. As it seeks for the eat it meanders as it goes where it can finally drift free. Shorebird Conservation Internship Opening in Los Angeles, CA!